On November 13 we welcome World Kindness Day. To celebrate, I’m linking up with the ladies of Tuesday 10, Rabia and Lisa, to share the 10 Times I Have Been Shown Kindness. Originally I thought I would look back on my life over the years and think of 10 epic times. However, the instances of kindness that started popping up in my mind occurred in the last 2 months. Why the last 2 months? I’m not gonna lie. They have been hard. Not “I’m homeless and I have no job” hard. That’s a level of hardness I can’t even comprehend. No, the last 2 months have been hard in a First World problems kind of way. The kids went back to school and I was faced with worrying about them socially and academically as well as the stress of a hectic schedule again. A month ago my beloved kitty died. I’m still more affected by that than I thought I would be. Plus, there were the usual stressors at work and the rejection of my writing by online magazines. Ouch. When family, friends, and readers reached out to console me about my cat. When my son’s teacher sent me email just to tell me what a kind, caring soul he thought my son was. When I shared that teacher email with a friend who genuinely shared my joy. When a friend watched my daughter before school so I could leave for work on time while my husband was out of town. When a blogging buddy (thanks Kelly L McKenzie!) helped me edit a piece that DID get published. When readers (like you!) and bloggers (like you!) commented and/or shared my posts. When another parent on my son’s hockey team brought him home from an away game because I was busy with his little sister at her game and my husband was out of town. When friends showed up at a community play my daughter and I participated in simply to support us. When my kids or my husband gave me a hug, just because they love me. Thank you to all who showed me kindness! 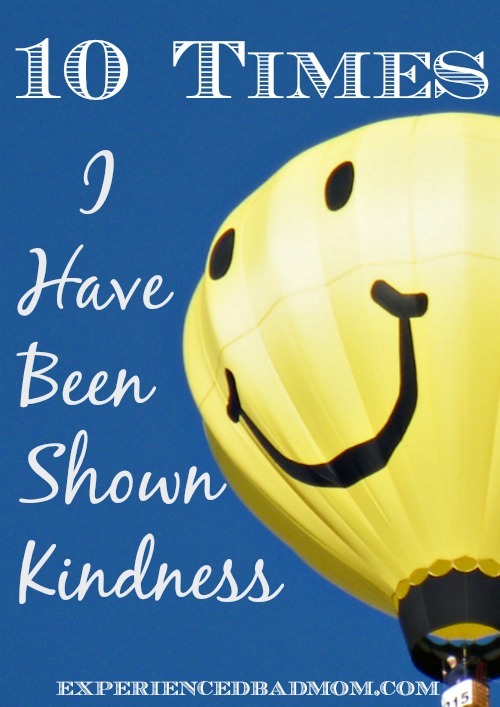 When did someone show you kindness recently? Kindness is infectious and it makes me happy to hear about it. Aw, this was a like a wonderful, big thank you note to those who have made a difference in your life recently and honestly loved reading it. Glad you have had some kindness and support, too during some rougher times lately. Thanks, Janine. I’m glad you enjoyed reading it. It easily could have been a “thank you” post as well as a “kindness” post! You WILL let us know when it’s published right? Kelly- what a perfect person to help. Love her. Chris, I loved getting that unexpected email. It was so kind of that teacher! What a sweet list! having your writing rejected stinks and losing a pet stinks. I’m glad some of these small moments of kindness have helped to brighten your days! Thanks, Lisa! It was fun participating in #TuesdayTen for the first time this week. What a lovely piece, Katy. Focusing on kindness or thankfulness can really help put things in perspective. Yay to getting that piece published! I just read it on Club Mid – so good. And I’m sorry about Mr. Tabbers – I just read that post too. Our dog Nellie is 11 years old, and sometimes I get morbid and think about what I’ll write about her when she is gone. That note from your daughter is priceless. What a compassionate soul she has. 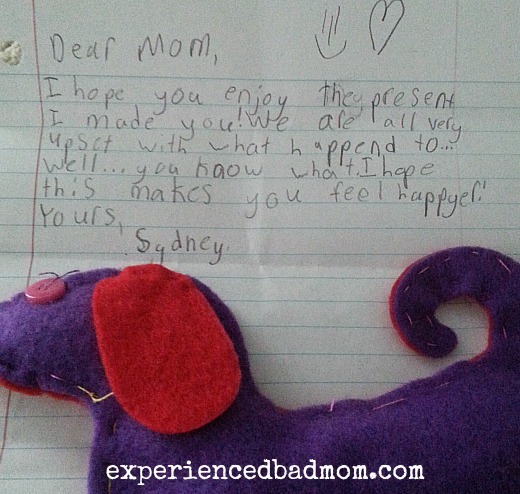 That note from your daughter is adorable. Oh, Katy. I’m sorry I missed this one earlier! These are great things to be thankful for. The little things are just as important as the big things when it comes to kindness!